We're having a Knit A Long for Kate Davies' Sheep Carousel. You can read more about it here. (Fiona) Carrying on from the last post, I knit backwards (unpicking each stitch one by one) for about 5 rounds. I had do this in very good light! 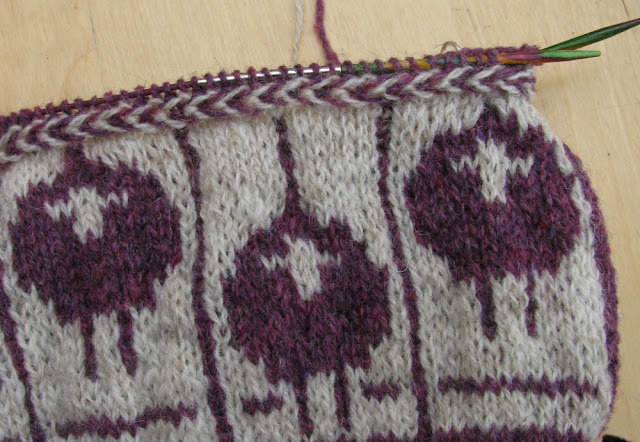 After marking my chart to remind my to do the faces as well as take note of the shape of the sheep bodies and the cast off (steek stitches) and decrease rows... I completed the sheep chart without further incident. Its quite obvious the difference in tension between my left hand (the white background colour) and the right hand (the purple). 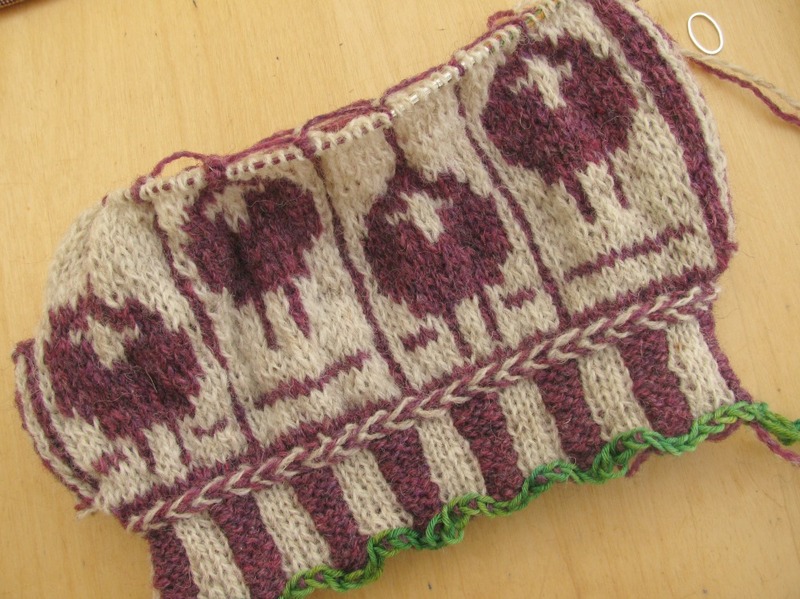 It seemed to get looser the more I knitted! Next up was another vikkel braid. This went quicker than before and my yarn did magically untangle on row 3 as predicted by Kate. It did not do this on my first braid, probably because I was stopping to take photos. The vikkel braid is remarkably simple. I remembered it as holding the old yarn down to the left and bring the new yarn over it (row 2). 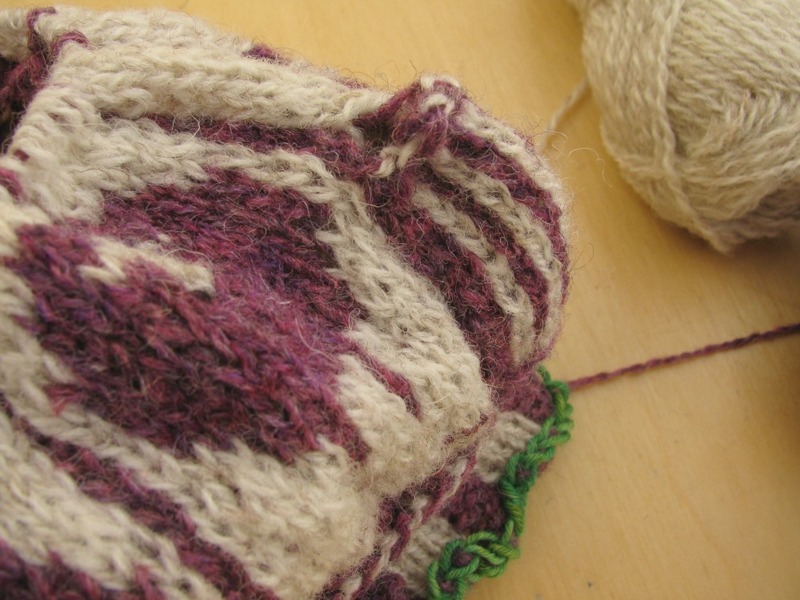 And hold the old yarn up to the right to bring the new yarn under it (row 3). I tried to pull my purl stitches a little tighter (perhaps because I'm generally quite loose anyway). Next up The Lid Chart! We're having a wee get together next Tuesday morning for those doing the Sheep Carousel or those maybe tempted to try. Tuesday 25th September, 10.30am - 12 noon at the shop. Bring your tea cosy and check out how others are doing, get some help or offer advice. Look forward to seeing you!